“The Women in Sport Initiative” was developed to raise overall physical activity levels among women and to support women’s roles within sports organisations. Less than one in five Irish women came close to accumulating 30 minutes of physical activity per day, for at least five days per week, as recommended by the World Health Organisation for good health. More than three quarters of Irish women do some recreational physical activity such as walking, swimming or aerobics, but that the majority do so with insufficient regularity or intensity of effort to meet the minimum standard. Over 20 per cent do so little that from a health point of view they can be considered sedentary. Kilkenny Recreation and Sports Partnership are making grants available to all eligible local clubs, groups and community organisations that promote increased participation in recreational sport or physical activity for women. 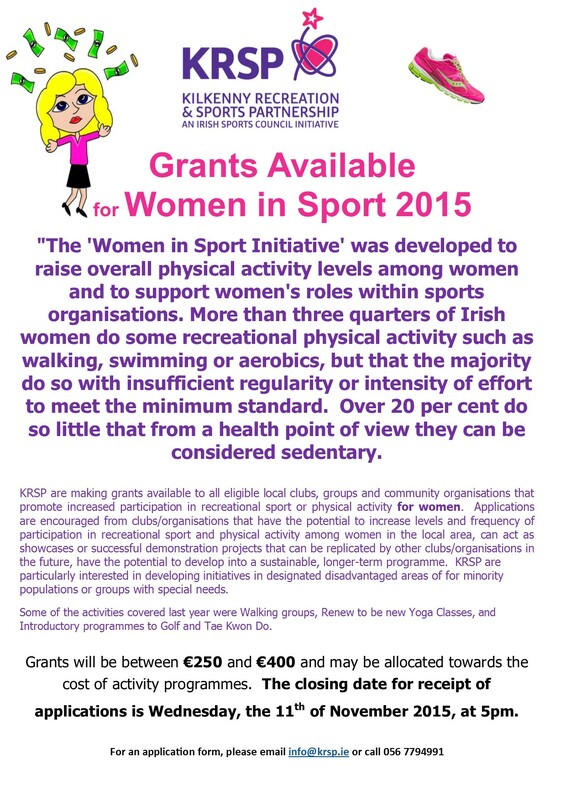 Applications are encouraged from clubs/organisations that have the potential to increase levels and frequency of participation in recreational sport and physical activity among women in the local area, can act as showcases or successful demonstration projects that can be replicated by other clubs/organisations in the future, have the potential to develop into a sustainable, longer-term programme. Kilkenny Recreation and Sports Partnerships are particularly interested in developing initiatives in designated disadvantaged areas of for minority populations or groups with special needs. Some of the activities covered last year were Walking groups, Renew to be new Yoga Classes, and Introductory programmes to Golf and Tae Kwon Do. Grants will be between €250 and €400 and may be allocated towards the cost of activity programmes. The closing date for receipt of applications is Wednesday, the 11th of November 2015, at 5pm. Please find application form attached. If you have any queries, please do not hesitate to contact the office at 056 7794991. Canoeing Ireland are delighted to announce that Phase 1 of the Canoeing Ireland online membership database is now live in Beta form. Members can now manage their Canoeing Ireland membership through the online Member Logon portal. New members can register through their club secretaries or through the individual membership portal. Club Secretaries can manage and renew their club registration and members through their own personal logon interface. There is a new map of registered clubs on the website. If your club is missing your club registration may be expired. The new member interface is fully responsive and looks great no matter what device your using. A big thanks to Brendan O’Sullivan from sulware.ie and all of the office staff at Canoeing Ireland for the hard work to get Phase 1 up and running. The first hurdle of many! Phase 2 will include some great interface developments including online course and event registration. Click here for a full break down of what to expect. Much of the background work is already done we’re just ensuring all the linkages are working properly and that the functionality is up to scratch. Our highly talented canoe sprint athlete, Jenny Egan, will be a guest on the “Game On” sports programme on 2FM from 19:00- 20:00 this evening. New Canoeing Ireland Database Coming Soon! Access from Abbey Farm estate on the Clane Road, Celbridge. Enter estate,third left and right at green. Congratulations to all the canoe and kayak clubs who were awarded a sports capital grant this year. It is great to see so many clubs being supported by the capital grant. This funding will have a huge impact at grass roots among clubs and their members.